Joanna Hill concentrates her practice in a wide variety of litigation matters involving copyright, trademark, rights of publicity, breach of contract, fraud and antitrust claims. Joanna has also taken on a number of pro bono matters, including asylum petitions and cases involving Section 1983 violations. 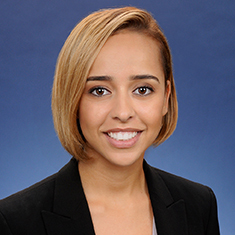 Joanna also serves as the co-chair of Katten's Los Angeles—Century City office's Minority Associates Committee. During law school, Joanna was an editor for the William B. Greene Hale Moot Court Honors Program. In addition, she worked for the Post-Conviction Justice Project, where she represented incarcerated women at their parole hearings and advocated for adults convicted to life without parole for crimes committed when they were juveniles. Prior to practicing law, she was a high school history teacher in Los Angeles. Shown below is a selection of Joanna’s engagements.